Most people don’t test their body fat for various reasons, it can be expensive and inconvenient. The scales that you can use at home are real hit and miss so the two methods I recommend are Dexa Scan (often times expensive but typically done by a professional) and BodPod (not quite as good as Dexa but inexpensive and I have found the results to be very similar). The big mistake everyone makes is they wait until they are relatively healthy to get tested and focus on what is one of the best versions of themselves. So did I. Man do I regret not knowing the actual progress I have made over time but I was unaware of the technology when I first started this last round of fitness. Trust me, I never walk into a Crossfit gym or start lifting weights without knowing that information. This isn’t the focus of this post so I am not going to dwell on this but if you start googling body fat testing you will see that even these results aren’t perfect, everything has a margin of error. With that said there are a lot of people walking around right now at 20-25% that think they are 16% and if they lose 4 more pounds the top of their six pack will start to show. Don’t let the number own you, use it as a baseline and get it checked every three to six months and make changes as you go. I have seen well over 200 people’s results and over 1000 readings and from that I have been able to see a few trends so I thought I would share some of those with you so that you can get better progress using your results as a guide. Let me first start off by saying that most of the tests I have seen are from people close to my age (44 years old). For the first reading many women start off at close to 40%, men as a general rule seem to average about 35%. This is for deconditioned athletes just starting off. Obviously I am speaking in general here but the majority of people that are doing these tests have experienced some sort of wake up call. By the time I found out about BodPod I had gone from 215 to 185 pounds or so and I still tested at 32% because I didn’t understand at that time how my body mobilized fat. To lose that weight I did the standard, do slightly more and drop the M&M’s and Coke diet. So doing these tests taught me that much more was going to be required if I wanted to actually mobilize fat. THIS IS MY BIGGEST REGRET BY FAR, at 215 I would have had a considerable amount of muscle mass that I absolutely wasted because I simply didn’t know the best path forward. Looking back now I would have prescribed changing what I ate and not how much (how much really wasn’t an issue and isn’t for most people, they just don’t know simple concepts to keep things in check). I would have prescribed adequate protein intake, I certainly wasn’t getting that. I would have been less concerned with fat and more concerned with which fats. Lastly I wish I had any idea at all about the role of carbs in my diet. As many of you know I am not a hater related to carbs for athletic populations but simply knowing about carb cycling would have changed my life considerably. I tried every diet out there before figuring out what works. So what works? For me it was changing to a diet of mostly whole foods and being a bit more conscious of timing and of course moving a bit more. I love Crossfit and I love lifting heavy weights but those things aren’t necessary to maintain a base level of health. Eating spinach and kale salads with your meat didn’t have a name for the year and a half I ate them before showing up at Crossfit. Only at that point did I know that was considered Paleo. I have learned a lot from all of my Paleo friends but when regular folks ask me how I eat to stay fit I say “I eat a diet of mostly whole foods and I eat for joy occasionally”. Since this post is for a relatively targeted audience (crossfitters attempting to eat to perform) if you are just beginning STAY OUT OF YOUR OWN WAY. Crossfit is hard, life is stressful don’t make it harder by placing what you formerly knew over the paradigm of Crossfit. Just show up, do movements that don’t hurt you, push your progress slowly and eat a diet of mostly whole foods and eat for joy occasionally. My carb recommendations aren’t for you. That doesn’t mean you should low carb necessarily but a moderate approach of 100g a day for women or 150g for men will probably serve you well for quite a long time. Don’t change how much you eat, change what you eat and consider some behavior modification. Also don’t give up everything all at once, I didn’t think I could ever give up coffee with cream and sugar and my morning bagel and I am currently writing this while drinking black coffee. Your goals will dictate the changes over time. One recommendation I do like from the Paleo world is being about 80%. If your 20% involves some form of treats I might suggest eating them before bedtime so you can go to bed full and happy. This is typically favorable for a good nights sleep. No one joins a Crossfit gym so they can gnaw on Kale for the rest of their life. Last thing for this stage, be patient, you don’t have to force change any longer. Eat to fuel your work capacity and as your work capacity gets higher the best version of you will eventually show himself/herself. Simply eating in a manner that gives your body more nutrients allows you to become a better version of yourself pretty easily. Most men can move from 35% to 20% in a relatively short period of time (let’s say 6 months in general) because their testosterone levels will start to rise as they are asking their bodies to do more. In the early stages I have seen men put on 10 pounds of muscle relatively easy. For a 200 pound male that is 5% right there. All that muscle allows more work capacity so goals start to get in line very quickly. Sadly this is the stage people actually get the will to test their body fat. So they never really know all of the progress they have made along the way. Knowing is so powerful. For women the journey is a bit trickier. Most women before they show up at Crossfit have relied on some version of cardio or eating less to manage their weight. So many women start off under fed, eating less protein than they should and relying more on carbs for energy. I have seen it too many times for it not to be a trend, a lot of women join Crossfit to hammer the nail harder. Cardio and eating less wasn’t working so they figure they better up the ante. When I am able to show clients how much they should be eating it is often astonishing. In this way diet rigidity is actually causing many of the problems. So simply eating adequate amounts tends to drive performance and increase work capacity relatively quickly. Symptoms of hypothyroidism and hormone deficiencies tend to start to go away. Metabolism starts to recover. Let me stop here, I realize I am on unsteady ground as a man talking about women and I am making blanket statements that may not apply to your situation but I cover various stages in this article. Also I am speaking in general, each of our situations is highly individual. Once women get things moving in the right direction metabolically I have seen a consistent trend of about 3 to 5 pounds of muscle gained and fat mobilizes pretty easily when they start getting out of their own way. Women have less testosterone than men so the muscle pounds tend to come a little slower but things get very favorable as it relates to fat loss when the metabolism starts to recover. This is similar for men as well. For both men and women early on is such a great opportunity to build muscle and capacity, don’t ruin your potential by getting in your own way and dramatically eating less it won’t help and won’t lead you down the path you want to go related to a better body composition. Once you start eating mostly whole foods your body is now nourished and you won’t typically be hungry near as much. This often leads to undereating and underperforming in the quest for better health. Your body looks good, certainly better than it did when you had 15% more fat on it but if you continue to test your body fat you will see that your VLC diet is slowing your progress as it relates to fat loss. I keep using this and if you follow this blog or this page you will see I use it a lot, simply using a bigger hammer here isn’t better (in fact it’s worse). One of the reasons you were able to mobilize a good amount of fat early on is because you had a lot of hormones that actually were able to help you get things moving. With insulin low it allowed your hunger levels to regulate themselves (Grehlin) and your brain starting to tell your fat to mobilize (Leptin). Basically it’s time to change things up, your body is pretty smart and it adjusted. So quit thinking like a fat person and start thinking like the athlete you have become. You don’t need to jump in head first either, just add 50g of starch to your evening meals. I prefer sweet potatoes but squash works and I even use white rice occasionally. I am not a fan of supplements (other than creatine) for this population but if you aren’t meeting your protein requirements daily or meals are inconvenient there are always “one off’s” that need to be considered. Before I say any of this we need to do the mirror test. As a general rule men carry their fat in their mid section and women carry their fat in their hips, legs and chest. Ladies if you have a large chest and big hips your body type might be the sole factor that keeps you from reaching these arbitrary goals (it could also lead to a ridiculously big squat and deadlift too). After all, these are just numbers, they don’t really mean anything and once you are even considering reading this part of the article most of the aesthetic stuff is pretty on point. So for this last part I am going to cheat. Look at the best performers in the gym, these are often the people with the best body composition. This is not an accident. Often these people will be seen sipping on protein and carb drinks post workout. The reason why these things become more important for these populations is because their increased work capacity has led to more muscle. When you have small amounts of fat your muscle becomes a viable source for energy and so maintaining that muscle mass becomes even more important than building it (which becomes a challenge at this stage). When your work capacity is high and so is your muscle mass obviously it allows for more fuel to increase your performance. Like most people when I first started working out “for real” I experienced good muscle gain. According to BodPod figures I went from 124 pounds of lean mass to 131 in 3 months. Then after surgery and some extreme dieting to keep from getting fat I lost a lot of that muscle I “supposedly” had gained. EGAD! Lost muscle, what the hell. The problem with this whole “lost muscle” phenomenon is that you aren’t really losing muscle or muscle tissue in most instances. Whether you are low carbing or just taking a conscious approach to your calories you are effectively decreasing inflammation levels in your body. The body is indiscriminate here, it doesn’t care if that inflammation is around your organs or in your muscles, it basically wrings you out like a wet towel. By the way I wish I knew all of this back then but you only really know what you know when you know it. I can also assume I will know other things later on that will help me greatly that I don’t know now. After getting under 20% which was a monster goal for me I decided to gain some muscle, so I started to drink a lot of milk. I really didn’t get substantially stronger doing that but I wouldn’t say I was getting the best coaching at that time either. I did however gain fat and went up over 20% again. So I pushed the panic button and it was the best thing that ever happened to me and my muscle. I was deadlifting and squatting using a Smith Machine and I never did either heavier than my body weight which was around 160 at the time. First let me say that I used two facilities, the first three readings were from a separate facility before I decided to start using the University of Minnesota (the first seemed a bit unprofessional). For the most part I would highly advise not to do this but in this instance the readings do seem to fit. It also should be noted that by the time I got up the gumption to test my body fat I was 31.4%, this was after I had lost 30 pounds. My workouts (the six months before Crossfit) consisted of a lot of high intensity cardio and towards the end I was dabbling with weights. Mostly it was body weight type stuff and long intense cardio sessions at a very high heart rate. Basically the day I walked into Crossfit I had 128 pounds of muscle. Within 6 months I had 136 pounds of muscle. So the net was plus 8 but that isn’t the real story, the real story is that I dropped 12 pounds as well. Once again if I could do it all over again I think I would have stayed at 160 knowing what I know now but back then body fat loss was a big driver for me. If I hadn’t been so cautious about the way I was eating I might have gotten to my lean body mass goals a lot faster. Live and learn. One year into Crossfit my lean muscle mass went to 141 but I had to go to a weight of 167 to get there. Pretty much every strength number went through the roof. Personally I think there are a lot of people walking around at plus 20% body fat that think they are sub 10 and for those people 15% probably seems like a death sentence. That is about where I have been for close to a year and I feel like the best version of myself ever. Let me stop here, when I BodPod I do it fasted in the AM, so when I say I was 167 I wasn’t walking around at 167 I was more likely at 170 most of the time. This was right around the time I deadlifted 405 for the first time and did 415 shortly thereafter. For any moron that says, “yeah, but you had to get fat to do so” is LOL to me. The average NFL quarterback is about 15%. So I think I am fine. Remember I really started this journey at about 215 pounds at some body fat % I wouldn’t have wanted to know. So yeah, I know what fat is and 15% ain’t fat. Let me also say that I did get under 150 but the BodPod facility I normally used wasn’t available. So I am just running with the numbers that are consistent. My goal with getting under 150 was simply to get under 10% for the first time and I did that. As you can see that lasted all of two days. I never wanted to be that small but in the end I was I glad I did it. I was weaker than I wanted to be and from that point forward my goal was to get strong without adding massive amounts of fat. Weight loss is mostly water loss that looks like muscle loss but there are many instances I could point to on this timeline where I got stronger and my muscle mass went down. So strength and muscle density can go up while mass is ultimately going down. Also early on you can see that I made mad gains with my fat loss related to losing body weight but around 20% I stalled hard. At that point what got me lower was gaining mass. I have had the pleasure of watching many people progress using Crossfit and actual data, if I had started Crossfit at 31.4% I would have been better off down the road but it only took me 6 months to get on that path in the first place. There is also that unknown time where I can only assume I was over 40% body fat. I wish like hell that was recorded but maybe I don’t get to where I am today knowing that. To go from 215 to 182 was basically just quit eating like a moron but it should be noted I was working out that whole year. So what looks like a 2.5 year journey is actually closer to 3.5 years. Also let me say this wasn’t my first rodeo, I got down to 175 in 2007 only to rebound up to 215. That was heartbreaking. The difference between then and now could be defined simply with one sentence. “Well this is what I definitely won’t do to lose weight”. I was following the standard advice of eating less and tearing down tissue. The big “a ha” moment for me came when I realized I could simply research and experiment to learn what works best for me. I have said it a million times since then “I was just too smart to be fat”. Learning why things work changed my life forever. I sat down to write the story of why I know I can get stronger without adding substantially more muscle but it felt incomplete without how the journey started. I took all of the data I have provided in this article and made many changes to my training and eating routine. Currently I am the best version of myself. 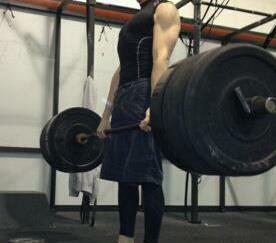 I recently deadlifted 405 x 8 which is amazing when you think only 2 years ago I couldn’t deadlift my own bodyweight. I love the way I look with my clothes off but I can’t say I ever hated it. My story wasn’t one of low self esteem, I ate for joy quite a bit but I still do. The amount of food I eat hasn’t changed much, if anything it’s more but I have changed what I eat. Most of what I eat adds to my overall goals and also provides me enjoyment. One extremely fair criticism of my approach is that it isn’t a hypertrophy approach. Mostly I lift to get strong and get better at Crossfit. If I was doing isolation reps for size my results would probably be a lot different and I might have more muscle size. That approach didn’t interest me then and doesn’t now but I respect the people that take that path. In no way am I saying that what I do is the best approach but it is the best approach for me. This was really well done. You could add a bunch of stuff to what he is saying but that complicates the issue and clouds the water a bit. I like the idea of short videos with good info, this one delivers that. The reason I have been blogging more about snacks and eating out is because those are the things that befuddle people the most. The reality is that you need to be able to have options when you can’t prepare your food at home. Once again this post is going to be somewhat controversial because it doesn’t fit everyone’s “diet of exclusion” paradigm. I don’t believe in diets of exclusion but if that is something that is important to you then hopefully this post can help a bit. Also before I start this is not what I eat on a day to day basis, I eat this stuff occasionally. All of it has some pitfalls but every example I use can be helpful related to a varied diet. Yes you might have to deal with some soy and no you can’t typically control the oils they cook with. Here is my suggestion to you, try a few places and ask questions related to your preference but don’t avoid the other places. This is why I am making this point, stir fry is available a lot more than you think, if you get overly weird about the oils and sauces you are going to find yourself hungry a lot more than you would if you just sucked it up and looked for a better spot in the future. A few bad oils and some soy/sodium probably isn’t what got you fat in the first place so allow yourself some leeway. The goal is progress, not perfection. The picture I will show is from a Mongolian Grill near my house. You might not have a lot of luck with the oils they cook your meals in but it’s relatively cheap. Sauce primer, go hot, you are pretty much stuck with soy/sodium so at least try and control the sugar content of your meal. When you eat with a good amount of veggies and meat you rarely get a super “spicy” meal. So that’s one tip, the hot sauces have less or no sugar. Also go to places where you can control the amount of sauce if possible. Certainly you can ask the server for less sauce but cooks don’t typically like you changing their recipes all that much. Less sauce to you might mean something different to them as well. So keep that in mind. Most Mongolian Grills allow you to choose your sauces and amounts. If you are on a performance diet (everyone should be at least a bit right?) I have said before that I think you should add white rice to the mix occasionally (I do it about once a week). I vary the amount of white rice I eat depending on workout days. Monday is typically my heaviest day so I eat a good amount of white rice the night before. I definitely like doing white rice the night before heavy days. When I say heavy day I mean just that, lifting for a one rep max. All of the other days I would just ask for less rice and if they don’t accomodate I don’t sweat it. Life’s too short to freak out on some server who wasn’t even the person that put your food on the plate. Lose everything you ever thought you knew about calorie restriction unless you are a body builder or you are fighting Manny Pacquioa next week. The rest of us are taking a more gradual approach. For mid day meals I like to keep rice out of the mix as a way of keeping fat burning high.